The muscles of the abdomen, back, and pelvis form your core. These muscles help support your body. With age, the core, like other muscles throughout the body, can weaken. 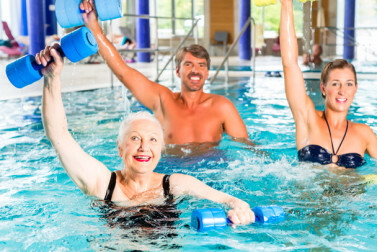 Core exercises for seniors are designed to keep the abdominal, back, and pelvic muscles strong and help you get around more easily. Abdominal crunches make excellent core exercises for seniors, because they?re easy to perform and you can do them anywhere. To do a crunch, lie on your back with your knees bent. Put your hands behind your head, or cross them over your chest. Lift your head and shoulders using your abdominal muscles, leaving your lower back pressed against the floor. Repeat 10 to 15 times to start. Gradually increase the number of repetitions as you get stronger. The bridge is another one of the strengthening core exercises for seniors. It works the abdominals, lower back, and buttocks muscles. To do a bridge, lie on your back with your knees bent and feet flat on the floor. Slowly raise your hips until your knees and chest are in a straight line. Hold for a count of three to five, and then lower slowly to the ground. Repeat five times. Superman is a position that works your lower back. Lie on your stomach with your arms stretched out in front of you. Raise your head, neck, and arms, along with both legs. Hold for a few seconds, and then lower. As you build strength in your back, you can also try fluttering your arms and legs as if you were swimming. Do the bicycle to work the muscles on the sides of your belly. Lie on your back with your hands behind your head. Lift up while turning your right elbow to meet your left knee as it bends in. Repeat on the right side. Do 15 to 20 repetitions, increasing the number of reps as you get stronger. 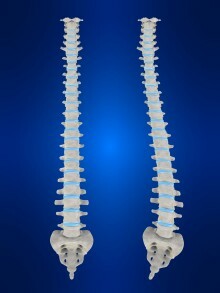 Scoliosis—a condition that causes the spine to form an unnatural curve and/or twist—is most common in childhood, tending to develop just before puberty. But the condition also can be a problem for adults, who can suffer from troublesome scoliosis pain and stiffness in the lower back. Medications, injections, supplements, surgery. They’re helpful treatments that have provided pain relief and improved function for millions of arthritis patients. But perhaps nothing can do as much for your joints, and possible rheumatoid arthritis or osteoarthritis symptoms as the things you can do yourself—namely, exercise and weight management. Within our body’s muscular system, we define the core as those muscles of the hips, pelvis, abdomen, and trunk. Beyond simply allowing or supporting certain movements, the core is necessary for flexibility, strength, and injury prevention.